The blog “Blackberry [sic] Software Just another WordPress weblog” has mentioned Impatica viaDock. Interest in this software is growing thanks to the terrific dissemination of information across the user community. Thanks to the owner of the BlackBerry Software blog for further spreading the earlier write-up from Via Ronen Halevy from BerryReview.com. Once again, we appreciate the support. Be brief and to the point. 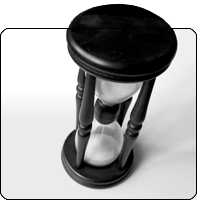 Online viewers have a very short attention span and they are only a single click away from leaving. The narration for each slide should be no longer than one minute and preferably less than 30 seconds. Use a script. Even though you may be highly effective as a stand-up or impromptu presenter, your online presentation does not benefit from your presence and charisma. More importantly, you do not have the benefit of watching and gauging your audience’s reaction and perhaps modifying your delivery accordingly. Edit and re-edit. Edit the script to produce the shortest possible way of delivering a clear, concise and focused message. Hire a Pro. Consider using a professional narrator and sound recording studio. This really depends on the objective of your presentation and on the intended audience. If, for example, you are using professionally prepared graphics, your presentation probably warrants professional narration. Try it out, review the results and judge for yourself. Identify the author of the presentation. Often viewers like to know who is speaking to them. Consider including a picture of the author, even if it is not the narrator, of the presentation. One of the best pieces of advice for recording narration is to use a good quality microphone in a quiet environment. You can get a decent vocal microphone for as low as $15-$20. 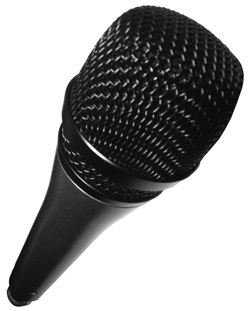 Generally, the microphone should be “unidirectional” (picks up sound in a single direction). “Omnidirectional” microphones pick up sounds from all directions, resulting in all noise in the room being recorded along with the voice. Most headset microphones will be unidirectional, whereas other free-standing computer mics are omnidirectional. Position the microphone close to the person speaking (try 6 inches in front of the mouth). The exact distance will depend on how loudly the person speaks, the type of microphone, and the desired type of sound. You can also experiment with having the microphone in different positions relative to the mouth. For example, try positioning the mic directly in front of the mouth, below the mouth pointing up, above the mouth and nose, pointing down, to one side or other of the mouth, etc. Most microphones will increase the level of bass frequencies when they are placed closer to the mouth. Close positioning will also increase the amount of detailed vocal sounds that are recorded. This can be a problem for such sounds as wind noises from the popping of “p” sounds and the sibilance of “s” sounds. Changing to a better microphone, or moving the microphone to a different location can help control these problems. Adding a nylon screen or foam mic head cover will cut down on these “pops” and “sss” sounds as well. Presentations will be much easier for the listener to hear if all the words are spoken in a strong, consistent fashion, especially when converting the recorded output to an Internet audio format like ours. The dynamic range of Internet audio and other highly compressed files is very limited. Words that are suddenly very soft in a sentence may be lost in the translation. Impatica is very pleased and excited to present our new website, www.impatica.com. The website has had a complete redesign that includes the release of Impatica viaDock. Impatica viaDock is a new Impatica product that enables you to access and control your BlackBerry from your personal computer. A connection between the computer and the BlackBerry is established between the free BlackBerry application, Impatica Connector, and the computer application, Impatica viaDock. Impatica viaDock provides the ability to make phone calls and to control virtually every application on the BlackBerry; including third-party applications. Impatica viaDock simplifies in-person or online training and sales presentations on BlackBerry functionality and applications. Additionally, Impatica viaDock makes it easier to obtain BlackBerry screen captures using third-party screen capture software. 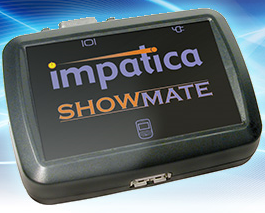 We are also pleased to announce that we have released Impatica Connector, Impatica viaDock and Impatica ShowMate at the new BlackBerry App World™. Beyond the new product introduction we have also launched the new Impatica blog, Impaticized!. Our new blog replaces the Impatica Tips newsletter that we were using in the past. The blog allows us to share news, events, tips and everything related to Impatica and our products. Impaticized! allows for feedback from our clients as well; articles can be commented on and questions posed. We invite you to subscribe to the Impaticized! RSS feed. The new website also provides improved access to the Impatica Knowledgebase through RSS feed article highlights on the support page for each product and on the Impatica Knowledgebase home page. The searchable Impatica Knowledgebase has answers to many commonly asked questions regarding Impatica and its products. New and exciting product releases and upgrades are in our future! We hope you subscribe to our blog in order to not miss any of these future announcements and articles. Through Impaticized!, we can now easily and efficiently communicate with our valued Impatica user community. Impatica is Serving up Services! Let Impatica create PowerPoint presentations from your vision while optimizing the file for conversion with Impatica software. Let Impatica enhance and optimize your legacy PowerPoint files for delivery with Impatica software. Synchronization of video/audio with PowerPoint slides, notes and animations. Do you have an idea for improving Impatica software in order to better meet your unique needs? Contract Impatica’s Services and Development team to work with you to make your requirements a reality. They will work with you to implement new functionality into the existing software or to potentially develop new software that benefits both parties.If your organization would like to learn how to better use Impatica software, personalized training is also available. e-learning materials to cover all aspects of developing content with Impatica software. Don’t see what you’re looking for or wish to discuss further?